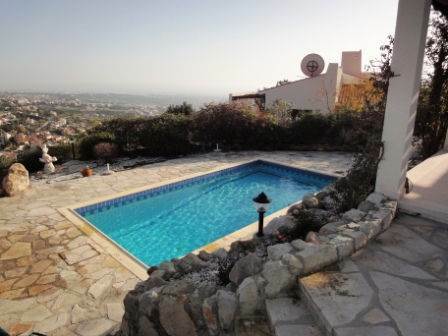 Kamares, Paphos - Located in a quiet residential street and nestled into the hillside, this spacious 3 bedroom bungalow is idyllically situated in the popular mountain resort of Kamares. The Kamares Clubhouse is nearby which has a restaurant, bar, mini-market, tennis courts, and a new medical centre. Upon arrival, steps lead down from the driveway and garage to a gated stone archway and the front entrance of the property. The entrance hallway with it's attractive arches, is the centre point from where all areas of the bungalow can be accessed. The kitchen is nicely separated from the living area by a breakfast bar, and is well equipped with all white goods. The washing machine and dryer are housed in a separate utility room. Accessed directly from the kitchen is a large paved terrace, again with wonderful views. An attractive pergola/barbecue area with worktops and clay oven, offers a perfect setting for outdoor dining and entertaining. The home is in excellent condition and has a high specification.